Fall East Siberian brown bear hunt and sockeye and silver (coho) salmon 15 Aug 2017. August 14, 2017 arrival in Khabarovsk, overnight in hotel Intourist (about $ 60 per night, per room) are not included in the cost of hunting. August 15, 07.00 am departure to the airport, check-in to Okhotsk. Flight to Okhotsk at 9-30 am. Arrivals to Okhotsk on the car moving (2 hours) in the village of Arka, loading in motor boats and a crossing to the camp. 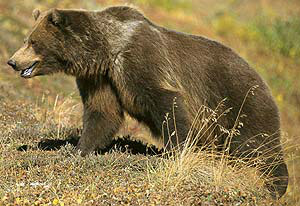 From August 16th to August 24th East Siberian bear hunting and fishing sockeye and coho salmon. August 24 departure for the village of motor boats arch, transfer to the airport for flight to Khabarovsk. Arrival to Khabarovsk, overnight in hotel Intourist.